The MXRevolution Wall Stand is designed for high patient volume applications in hospitals, imaging centers and busy specialty medical practices. 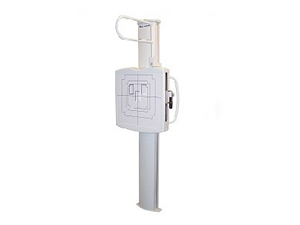 The MXRevolution Wall Stand meets all of the demanding requirement for upright radiography including lowering the image receptor to the floor for weight bearing studies. The MXRevolution Wall Stand has a robust streamlined design with soft, rounded edges to make it an attractive addition for any hospital or busy imaging center. range of upright, standing and cross-table lateral studies.